He was making them weekly, if not twice a week to perfect them. Enough!!!!! And he's still going at it strong. This is the "5 Minute No-Knead Bread" recipe he found. Can't remember from where, but I'm sure you can find it everywhere on the Internet. This recipe makes 4 "boules" also known as small round loaves. In a large bowl, add the yeast to the lukewarm water. Add the rest of the ingredients and mix well with a Danish whisk or use a stand mixer if you are wealthy enough to have one. A big wooden spoon will also do. The final mix should have a "ropey" appearance. Cover the bowl with Saran Wrap and then with a cloth. Place in a warm spot (top of the stove or fridge) and allow to rise for a minimum of two hours. It should double or triple in size. Make sure you use an appropriately sized bowl! 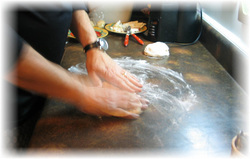 Once risen, remove the bread to a floured surface. Dust the dough well with flour and turn it on the floured surface a couple of times. Do not knead the dough! 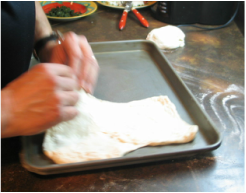 Using a large knife, cut the dough in four. You are now ready to bake. If you are not baking the whole batch, you can store the remainder boules in separate air tight containers in the fridge for up to a week. 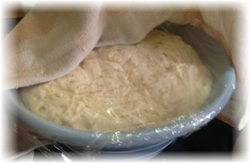 The dough will continue to rise so make sure the containers are big enough to accommodate the rising. Otherwise, you can freeze them individually, but they will be good for pizza, not bread. Sneak peak at dough rising. Start laying and stretching. In this pan, two were made. Preheat oven to 450 degrees for 40 minutes before baking. Twenty minutes before baking, put a shallow pan of water (about 8 oz.) in the oven on the rack below the bread rack. This will encourage a crusty bread. The bread will be placed on the middle rack. Allow the bread to rise for another twenty to thirty minutes before baking. After this second rising, form the boule by taking it in your hands and turning it laterally a couple of times while pushing up the middle part from the bottom. You should end up with a nice hemispherical shaped loaf. Don't worry about the hollow you create in the bottom by doing this as the loaf will fill itself out when you put it down. Dust a cookie sheet or pie pan liberally with the cornmeal. This will keep the bread from sticking to the pan during baking. Put the loaf in the pan and with a serrated knife, score it to a depth of about a quarter inch a few times across the top. A tic tac toe pattern looks swell once baked. Bake for thirty minutes or until the bread is a nice dark golden brown. Remove from oven, and place on a wired rack to cool. If you are lucky enough, you will hear it crackle while it's cooling. Congratulations, you are now a bread baker and can quit your day job! PS. Play with it to get different sizes and shapes. Also try different size pans to see which you like best. Happens when they are too close... or too big. Click an image from the right or place mouse over the image below and click Play to view as a slide show. Stir in yogurt (or buttermilk) and eggs. Bake for 25 to 30 min. (done when it springs back), remove from pan, and cool on rack. Our preference is with Greek Honey yogurt. Mixture is thicker with yogurt than with buttermilk. If no “Honey” yogurt, buy plain and add 1-2 tbsp. liquid honey. 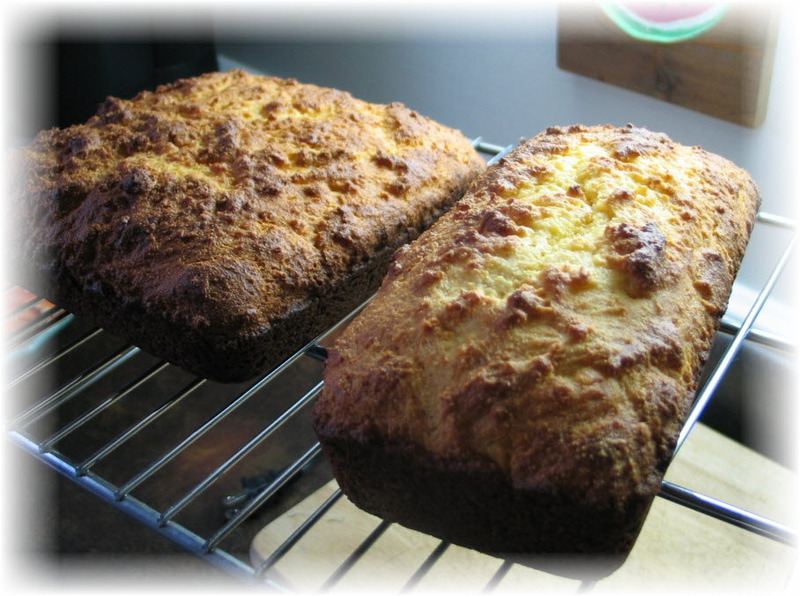 We prefer a loaf pan ‒ rises nicer as seen in picture. Don’t try to pat the mixture evenly ‒ either way, it will be thick. It’s a dense loaf, not Bamby bread. Like a pizza but not. Much better. They are made from the same bread dough as above. They can be round or square. Our preference now is square. Toppings are to your liking, but from experience, less is more. We like black olives and fresh pieces of tomatoes. Top with sea salt, fresh pepper, rosemary, or other. Recently discovered on Italian Food Forever. Stuffed with spinach, mozzarella, and gorgonzola cheese. As a twist, I added fried mushrooms. I was amazing! Will definitely make again. The next day, I warmed pieces in the microwave. Putting it in the over would have made it too hard. Divide the dough into two. On a floured surface, pat down or roll into two 10-11 inch circles. Place one circle on an oiled cookie sheet then sprinkle the cheese evenly over it's surface. Spread the spinach across then cover with the remaining circle. Using your fingertips, gently press the edges together. Create dimples across the top surface using your fingertips, and drizzle over with the oil. Sprinkle the salt and rosemary on top.